with people. There has to be a certain something about the person or nothing will never develop. They will remain just somebody you know in passing, might say “hi” to as you walk past in the street because you recognise them. But you wouldn’t necessarily stop and talk. And to be frank my previous interaction with Brigid had left me pretty much as cold as the Imbolc snow that so often scatters the ground at that time of year. So I think it goes without saying that I was more than a bit shocked when during the vigil a quiet internal voice instructed me to continue to light candles until Equinox. Publicly Ive been wearing my Druid hat almost as much as I’ve been wearing my Wiccan hat of late so it occurred to me that this sudden tentative spark of connection may be related to that, Brigid is a goddess of poetry and often a patron to Bards. It also occurred to me that it was an aspect of Brigid I was feeling as a soul calling rather than an actual connection. At that early point of connection during the vigil it was close to seven weeks since I had set foot on Anglesey, the longest I have gone in well over 18 months. The author Kristoffer Hughes suggests that the Goddess of the river Braint which bisects the Isle of Anglesey is a localised version of the Goddess Briganti, whom many believe to also be Brigid 1. 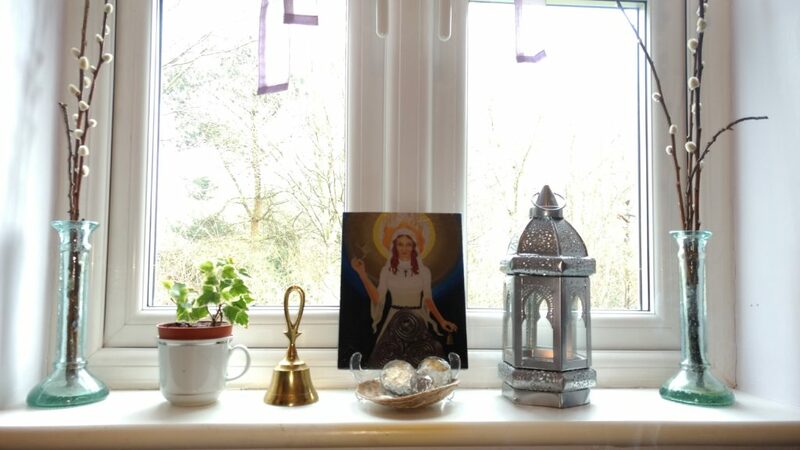 Therefore although admittedly in a reluctant manner I started lighting a candle whenever I sat down in my study and when away, I made an effort, if only for a fleeting moment, to think of Brigid and her sacred flame. After all Imbolc to Equinox was not a long time, right? Of course Spring is now most definitely upon us and Equinox is looming fast and I find that the whole catalog of synchronicity which has followed is such that I am now left without a shadow of a doubt that the relationship now has some form of chemistry going on. A spark of interest which wasn’t there before. What that interest is I have no idea, and whether there is a longevity to the interaction is equally mystifying. However, the more I read about her, the more I can see the similarities she shares with the two other Goddesses that have at one point or another shared my life. And there are a couple of aspects which have me positively entranced. For example, How can a fairy Princess, the wife of Angus the Ever young, a Tuatha de Dannan also be patron of smith craft, an occupation which even into history is an Iron rich activity? And with that I thought I would finish with an enchanting poem I found telling of the search of Angus the Ever young for his Princess. Through the brown woods bare. All Hail! This entry was posted in General, Goddesses and tagged Braint, Bride, Brigantia, Brigid, Brigit, Goddesses, Imbolc on March 13, 2017 by Tara.